I’m writing this on a grey last Friday in July morning, but I have some defiantly sunny news to impart. 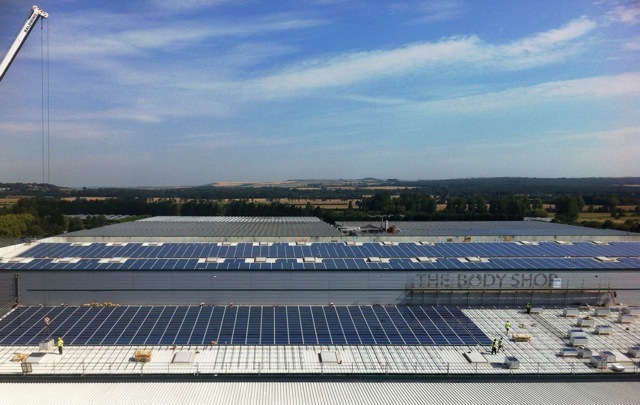 The Body Shop has just completed, in 9 weeks, Britain’s largest self-funded (paid for by the company itself) rooftop solar energy system at its head office at Littlehampton in Sussex. 3,840 solar panels covering an area equivalent to 24 tennis courts will provide enough energy (approx. 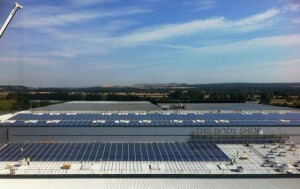 900,000 kWh of electricity a year ) to meet a quarter of the office’s needs. That’s equivalent to the power used by 250 houses. It cost to £2.8million, and the investment will be recouped in 7 to 8 years. Another renewable energy success, then? Yes, but it marks a setback at the same time. Today is significant, because it’s the last day that big solar schemes, generating more than 250kWh., qualify for favorable deals on the energy they produce under the UK government’s Feed In Tariffs (FIT) scheme. Because the eco retailer beat the July 31 deadline, it will be paid 29.3p per kWh by the National Grid for the energy the panels produce. An amended FIT starts on Monday, 1 August: thereafter the tariff will drop to 8.5p per KwH. That said, even a modest start is better than nothing. As the Body Shop and other companies operate their systems, we will get to know in some detail how much solar energy they are actually producing, and how this varies with levels of sunlight throughout the year. And this information may inspire many more householders, who still have a very attractive deal available, to go solar. But what a pity the scheme had to be cut back. Paul McGreevy, The Body Shop International Director of Values commented: “The Body Shop has always pioneered in environmental initiatives, and we are delighted to be able to continue our commitments to protecting the environment. Previous PostHand picked solution to a sustainable scallop future	Next PostTo know or not to know–that's the holiday question.